You can also Donate and help support the SSUFF by helping offset festival cost. No matter how small or how big your donation, it's very much appreciated! 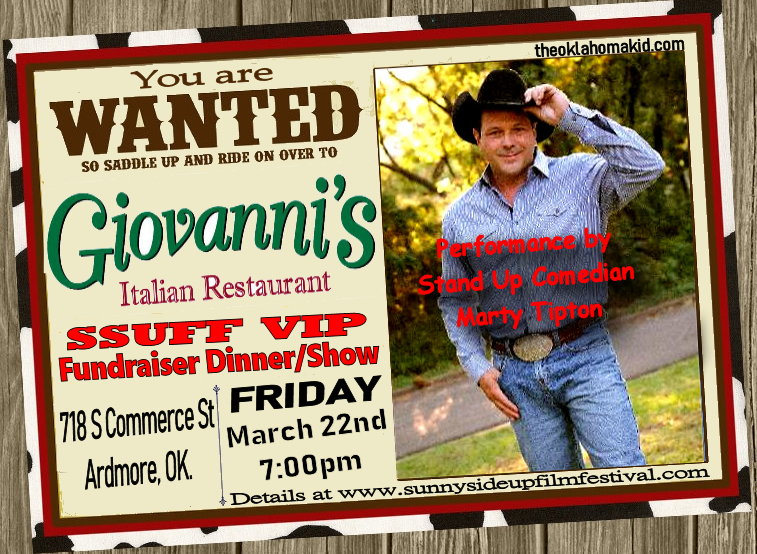 THIS WILL BE A FUN EVENING AT "GIOVANNI'S" TO HELP KICK OFF THE 2ND ANNUAL SUNNY SIDE UP FILM FESTIVAL! help us offset large film festival expenses. Registration & processing fee is $10 per person. 6:30pm to 7:00pm, but must be paid by cash only! The registration fee will cover your entrance into the private dining area & will include the comedy routine by (family friendly) Stand Up Comedian, Marty Tipton aka "The Oklahoma Kid". The registration/processing fee DOES NOT include cost for your meals, drinks, tips, etc. Everyone attending is expected to purchase their own meals, drinks, desserts, etc., from Giovanni's Restaurant menu. No other food or drink will be allowed in. Also, please remember to tip your waiters & waitresses!